The catalyst for this particular CD was Abbos Kosimov, who is regarded as one of the greatest exponents of the doira-the national instrument of Uzbekistan. Hands On’Semble first met Abbos at the Tainan Chi-Hsi Int’l Arts Festival – Int’l Drummers Gala in Taiwan in 2003. Since then they have remained in contact through email, searching for an opportunity to work on a project together. On a moment’s notice, almost two years since their meeting in Taiwan, Abbos came from Tashkent to L.A. to collaborate with Hands On’Semble over a two-week period which resulted in the recording of all of the tracks for HAND’STAN. Brad Dutz – L.A. session percussionist heard on countless albums and soundtracks for film and television. Together these artists work through a kaleidoscope of rhythms, forms, and soundscapes, exploring the multitude of commonalities, bridging cultural and musical differences, creating an entirely new work for percussion based on tradition and bound by none. “World music, hand drumming, fascinating rhythms and beats galore, are presented in fine form on this enticing recording. Hands On’Semble is a contemporary percussion ensemble devoted to the art of hand drumming. Founded in 1997 by percussionist John Bergamo, along with Randy Gloss, Andrew Grueschow, and Austin Wrinkle. 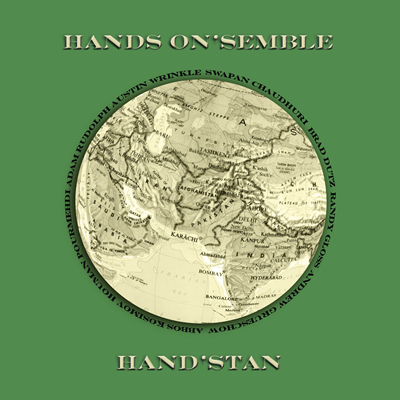 Hand’Stan is the groups fourth CD, this recording is a blend of various styles, presenting master drummers who specialize in various percussion instruments. Abbos Kosimov, renowned doira player from Uzbekistan and Swapan Chaudhuri, from India, a master tabla player are guest musicians on the project. Inviting music for drummers and non-drummers alike, presented in a pleasing manner that is quite entrancing.